Working in the cold and snow, really takes a lot out of you. We seem to be able to withstand so much less actual physical labor when it is cold. I guess burning calories to maintain your body temperature just wipes you out faster. Nevertheless, after doing all the morning chores, we just went out and ran the logs we already had down on the ground through the sawmill. 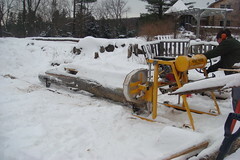 We had a 12 foot oak log down, which will make one layer of a floor in a shed, and two twelve foot pine logs, which he got one crappy 6 x 6 out of, a little siding, and we put the other one aside for another day, because it had tons of dirt frozen on to it. There is another twelve foot pine log on the sawmill, but the blade broke (as in, broke) at about 3:30, so we called it a day. I multi-task pretty well, and managed to throw the ball for the pup in between off-loading the sawmill as Frank ran it all through the mill. But the pup is still trying to figure out winter. 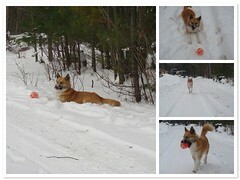 The ball gets lost in the snow! He doesn’t have a pond to dip into when he gets tired. He so loves snow, though. We are getting another pup — a girl — in about 10 days, and I can hardly wait! She is a black & white Icelandic sheepdog, with a really rare bloodline, and so darn cute! I’m a bit nervous as to how we will handle another dog, but it worked out so well with Bjarki that I am assuming everything will be fine. FINE! This entry was posted in Bjarki, Farm Life. Bookmark the permalink. Post a comment or leave a trackback: Trackback URL. I’ve been lurking on your blog for some time, and just wantedd to know how much I enjoy reading it. Congratulations on the new puppy! Plus, I see you’re also on LibraryThing. Isn’t it great? I’ve been there since 2006 – user name Talbin. Thanks for the compliments. LibraryThing is fun. It’s a social networking site that I actually understand. We’re MackHillFarm there by the way.